Opuntia ficus-indica , the Indian fig cactus, may be the most economically important cactus. It is used or has been used for food, medicine, livestock feed, fencing, an ornamental, and an indirect source of dye. Opuntia ficus-indica is a prickly pear cactus that probably originated in central Mexico, but it has been cultivated for so long that the location of origin and the appearance of the original wild plant is not known. Before the time of Columbus, the plant had been spread to the Caribbean islands and it is reported that the plant was used by the Nazca in Peru. 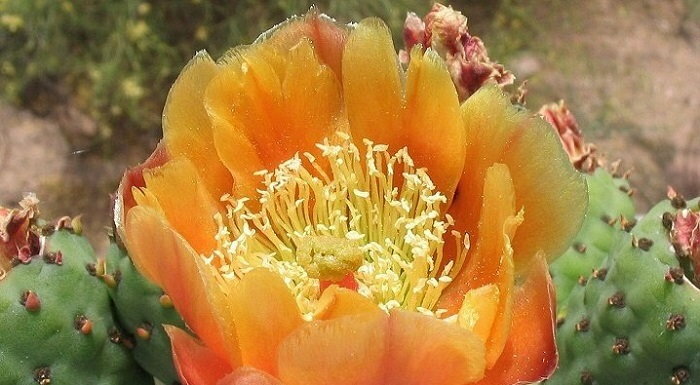 Native people used the plant for food, medicine, and as a source of cochineal dye. The bright red scale type insects produce a wonderful red dye that was highly prized by the ancients and is even in use today as well. There is a disputed claim that Columbus brought the plant back to Spain after his first voyage. Regardless of when the plant first reached Spain, the Spanish were intrigued by the plant. The appearance of the plant was unlike anything in Europe. Also, the economic aspects of cochineal dye, which is derived from cochineal insects that feed on the plant, were of great interest. The plant quickly became naturalized in Spain and the Moors spread the plant to North Africa. The plant quickly spread across the Mediterranean region and became so ensconced there that some early botanists thought that it was native. The arid climate and well-drained rocky soil was an ideal setting for this New World plant to establish itself in this area. It was introduced to the Canary Islands for the cochineal dye industry. A major industry was created and remains to this day. Cochineal dye is a red dye that is derived from the bodies of cochineal insects, which feed on prickly pear plants. In modern times, the dye is most often used as a natural source of color for food and cosmetics. Many foods, such as candies that list the food coloring as 'natural' use the cochineal insects to tint the food. They just don't advertise the fact that they are using bugs. Prickly pear was also recognized by Europeans as a source of fruit. Large plantations were established on Sicily. Sicilian farmers developed a method for producing larger fruits with fewer seeds. The first flush of flowers is removed before they can set fruit. The second flush of flowers then produced the fleshier fruits that bring a higher price at the market. Opuntia ficus-indica reached what is now the United States when Spanish missionaries brought the plant to California in the 1700s. The fruit was used for food. Mucilage from the pads was used as an adhesive in making adobe bricks. The cactus was planted at all of the mission complexes and one of the common names for the plant is mission cactus. It was also planted on the old California ranchos, where it was used as food and fencing. The plant has become naturalized in parts of California. 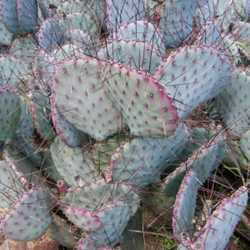 Luther Burbank developed many cultivars of Opuntia ficus-indica, including a spineless variety that was promoted as cattle feed. His nutritional claims were exaggerated but the plant is a good source of calcium and phosphorus. Commercial plantings of Opuntia ficus-indica are found in Mexico, Sicily, the Canary Islands, Argentina, Brazil, Chile, Algeria, and South Africa. The plants are usually grown for the fruit. The fruits are called tunas in Latin countries and are eaten as-is or are boiled down to make miel de tuna (prickly pear honey) or queso de tuna (prickly pear cheese). A drink called colonche is made by fermenting the fruits. 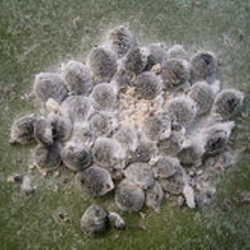 Young Opuntia ficus-indica pads are also eaten. In Latin countries the pads are called nopales or nopalitos. Fresh tunas and nopales, with spines and glochids removed, and jars of sliced nopalitos can be found in supermarkets in the southwestern United States. This cactus is also used medicinally. In Sicily, the flowers are made into a tea that is drunk for kidney problems. Dried flowers are ground into a paste and applied to the skin for measles. 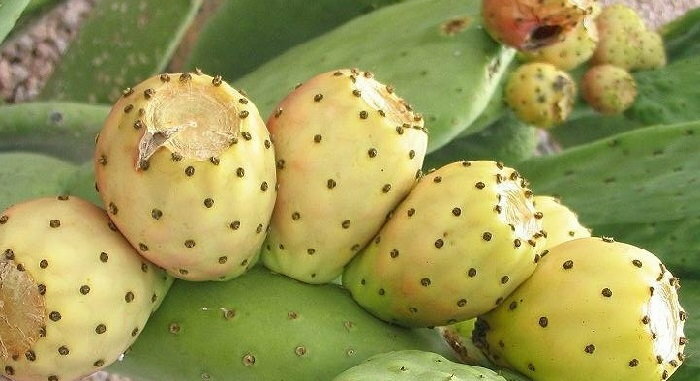 There are reports that extracts of Opuntia ficus-indica are an effective treatment for a form of abdominal cancer. Opuntia ficus-indica is a large plant, up to 15 feet tall and 10 feet wide. Flowers are yellow to orange. Fruits ripen from yellow to red and are 2 to 3 1/2 inches long. Care must be taken when removing glochids from the fruit. Wear rubber gloves or impale the fruit on a fork and peel away the skin with a knife. The plant is hardy in USDA zones 8b and warmer or Sunset zones 8, 9, 12-24, H1, and H2. It is very drought tolerant but in the hottest regions, fruit production is best with regular watering. 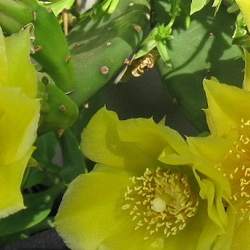 Opuntia ficus-indica is a useful plant and has been for centuries. Whether used for food, medicine, cochineal dye, or just an ornamental, it has found a home around the world. Fruit and flower photographs courtesy of PlantFiles.